Even after his fairly memorable appearance in The Force Awakens two years ago, our understanding of Supreme Leader Snoke (Andy Serkis) is slight at best. That’s to be expected, given we’ve yet to see Serkis’ scarred alien antagonist in the flesh, but with the release of Star Wars: The Last Jedi in December, writer-director Rian Johnson will surely begin to peel back the many layers masking the galaxy’s greatest threat. However, for all of the secrecy currently surrounding The Last Jedi, over the past few weeks, a series of unfounded rumors have threatened to pierce Disney’s radio silence. Case in point: leaked artwork that appeared to showcase Snoke’s Elite Praetorian Guards as they’ll appear in December’s blockbuster sequel. Cloaked in blood-red armor, each sworn protector appeared to be wielding a double-edged spear, and we’ve got another piece of Star Wars content for you to pour over today. 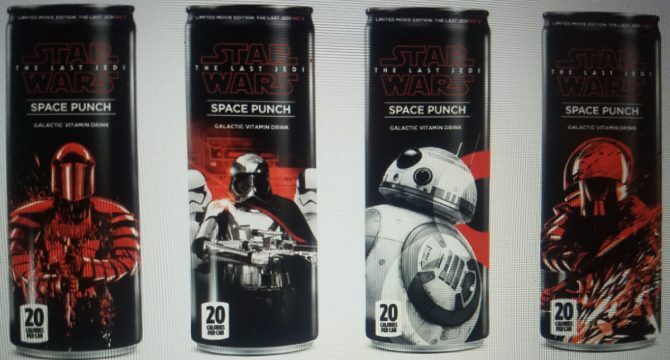 File this one firmly in the rumor cabinet for now, but TheForce.net (via Screen Rant) has seemingly located the latest piece of tie-in merch for The Last Jedi, which places BB-8, Captain Phasma, and two of Snoke’s fearsome guards on a line of vitamin drinks (see below). If nothing else, it leads us to believe that those original designs are indeed legit, but with no official word from Disney and/or Lucasfilm, it’s best treating these rumored marketing promos as just that. Star Wars: The Last Jedi zooms into theatres on December 15th and may well introduce a new Lightsaber for Daisy Ridley’s Rey – that is, if a leaked screenshot from DICE’s Battlefront II is any indication. Crafting one’s own Lightsaber is an important rite of passage for any Jedi, and we know that Rey will undergo some fairly intense training while aboard Ahch-To, so perhaps Battlefront II‘s in-game content is hiding a potential spoiler in plain sight? We’ll find out in due time.